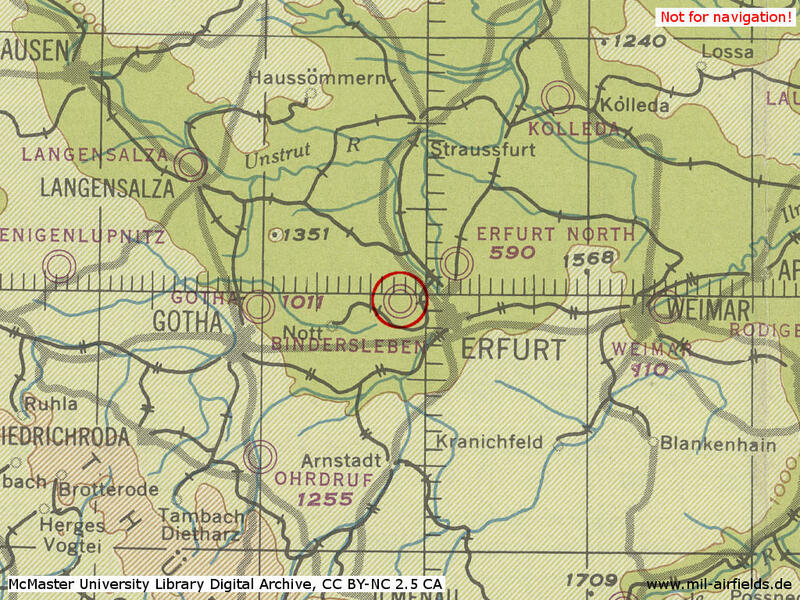 5 km west of Erfurt. 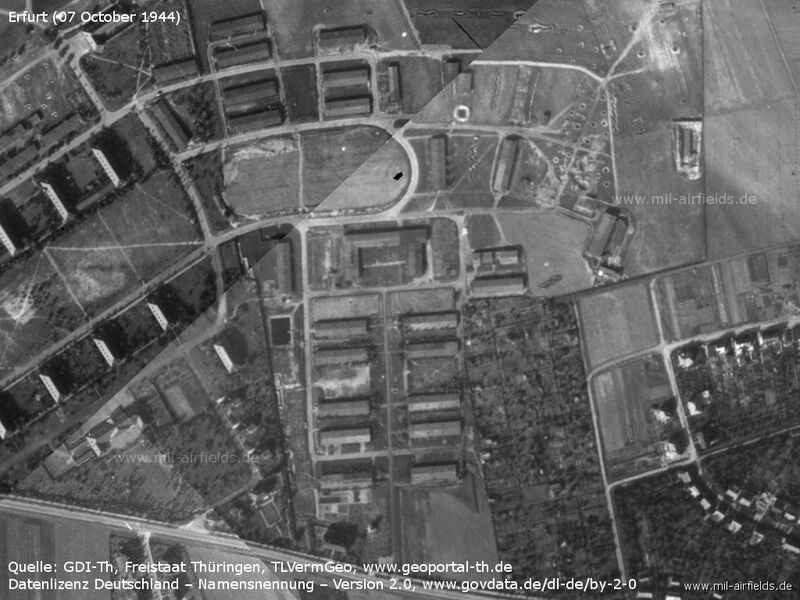 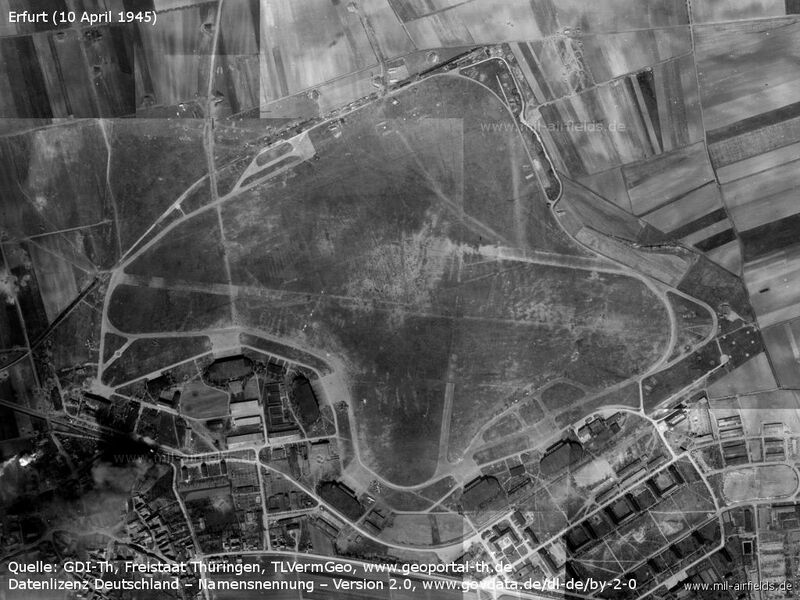 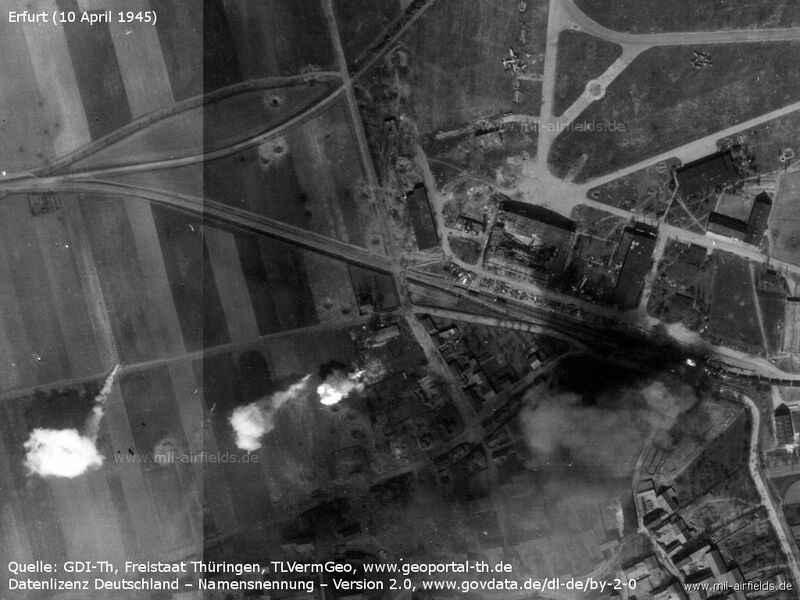 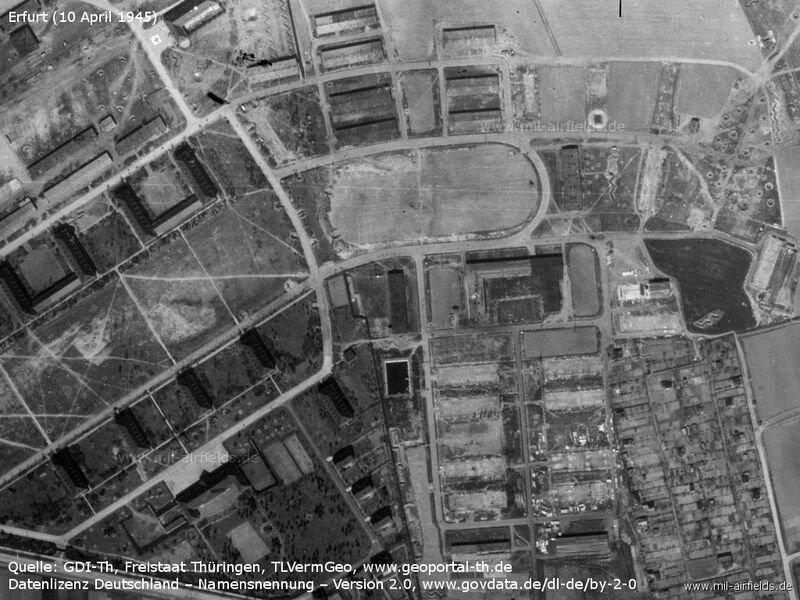 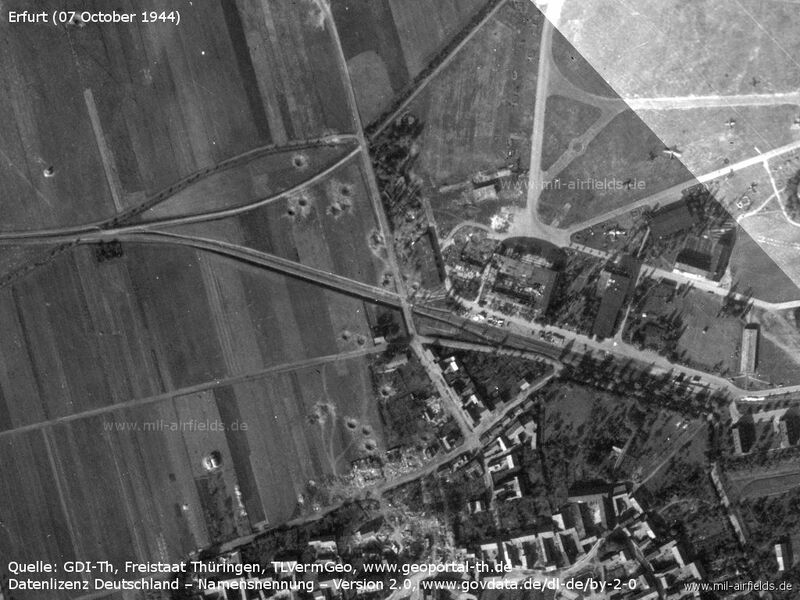 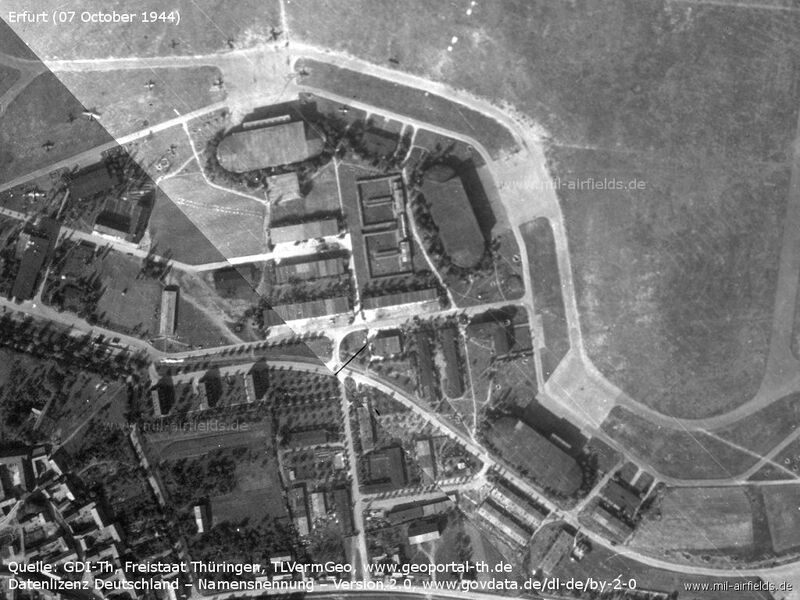 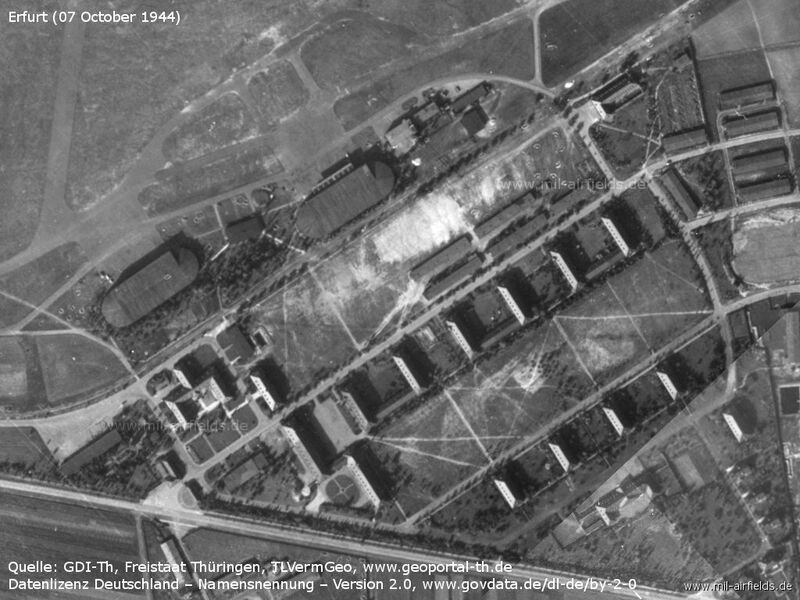 Fliegerhorst Erfurt-Bindesleben Air Base and surroundings on 07 October 1944 - The image is composed of several aerial photographs. 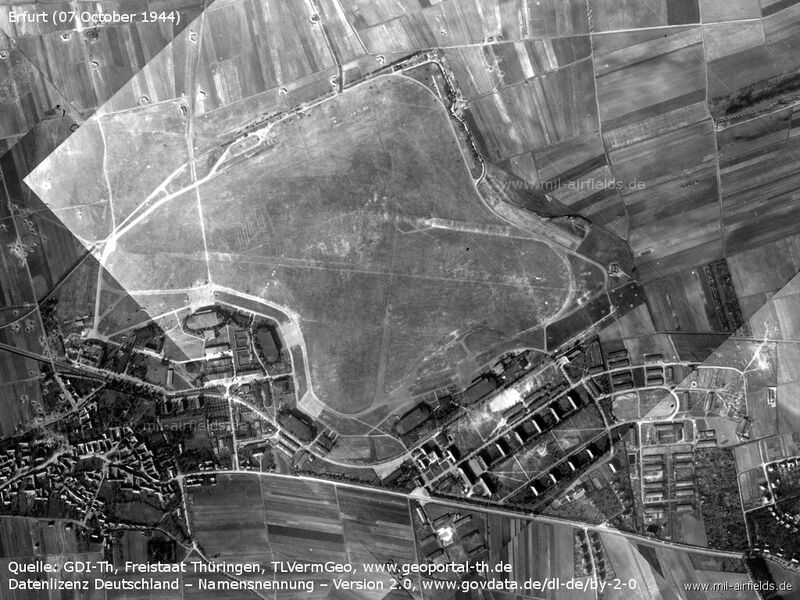 1: airfield; 2: dispersal area; 3: shooting range; 4: railroad line Erfurt - Nottleben. 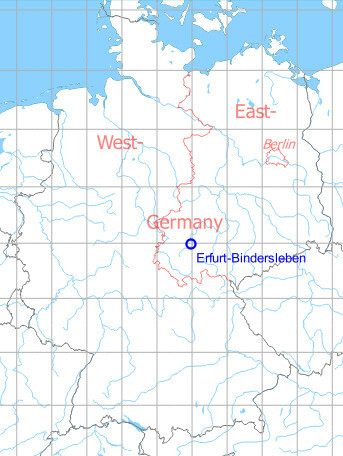 Other places: Alach, Bindersleben, Peterbornsiedlung, Salomonsborn. 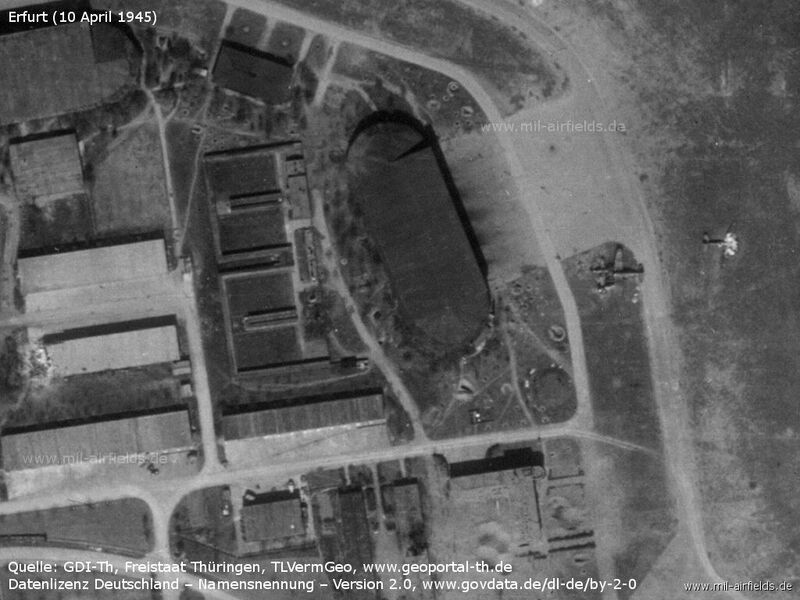 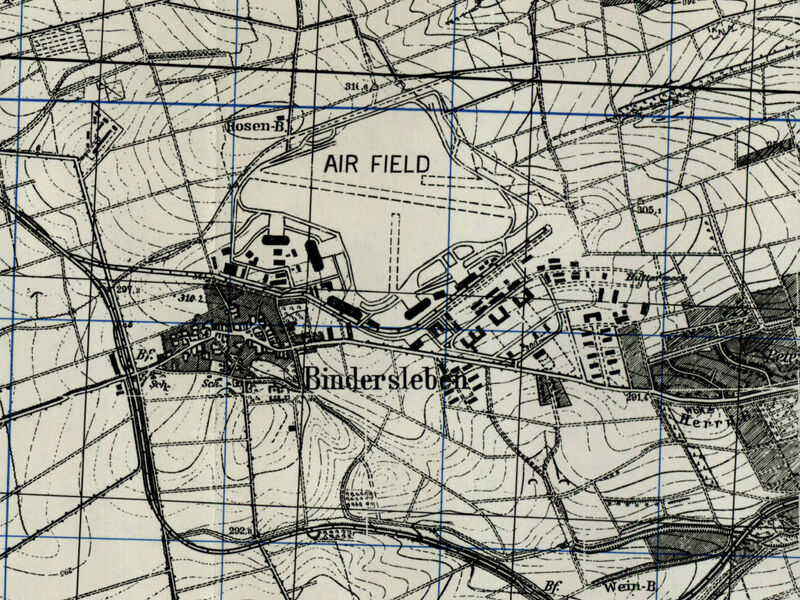 Erfurt Bindersleben airfield on a US map from 1951 - The shelter above the center and the shelter to the right of the center seem to be damaged. 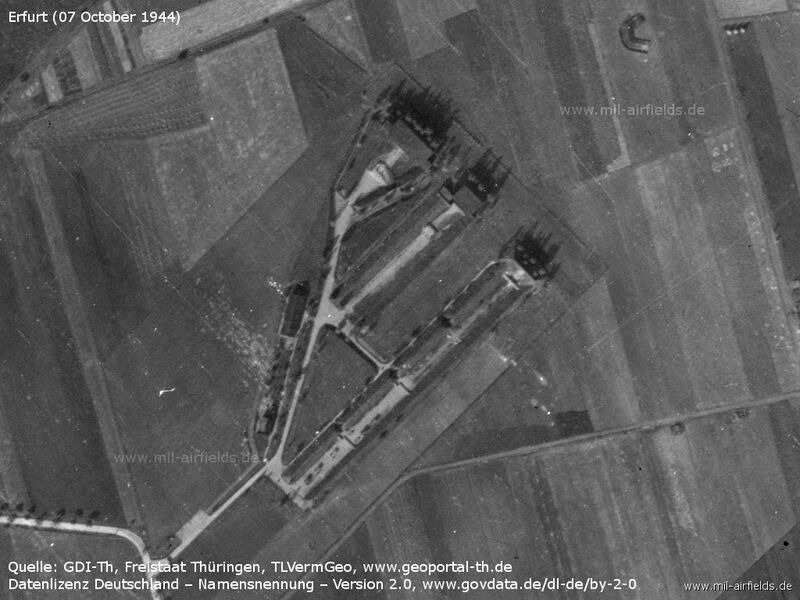 Northern tip - There are some planes here. 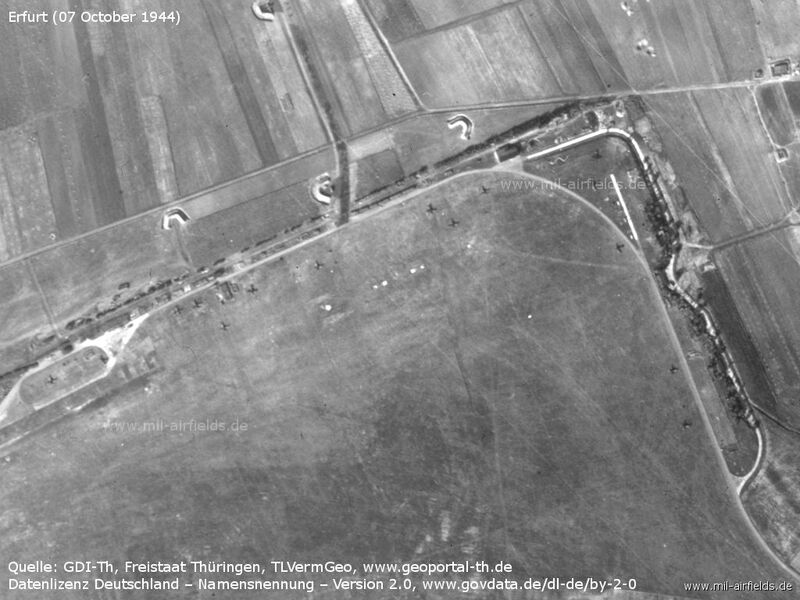 West side with railway connection - Some bomb craters are visible. 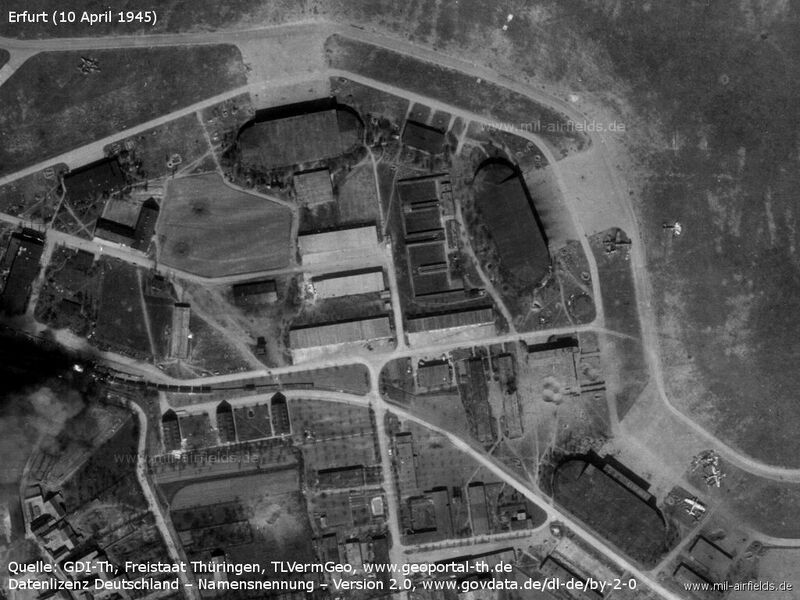 Aircraft hangars on the west side - There are also some airplanes here. 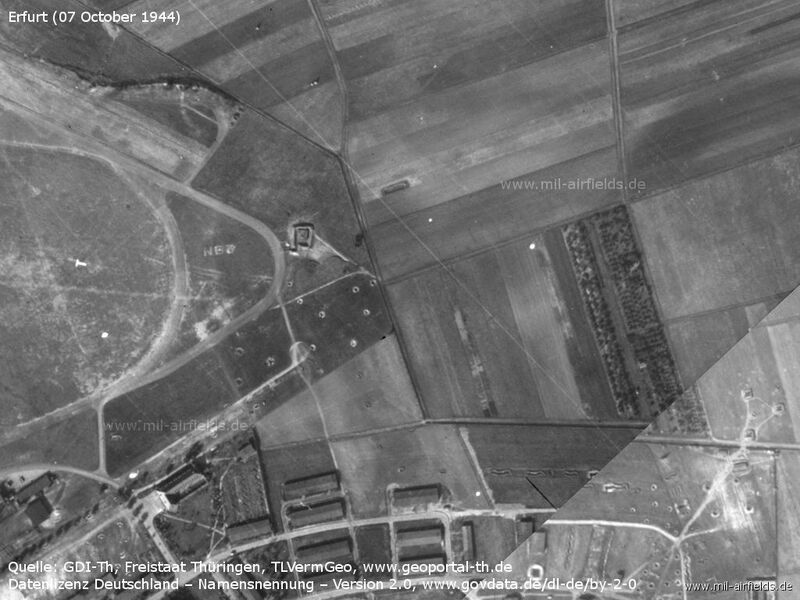 East side of the airfield - A flak position can be seen at the bottom right. 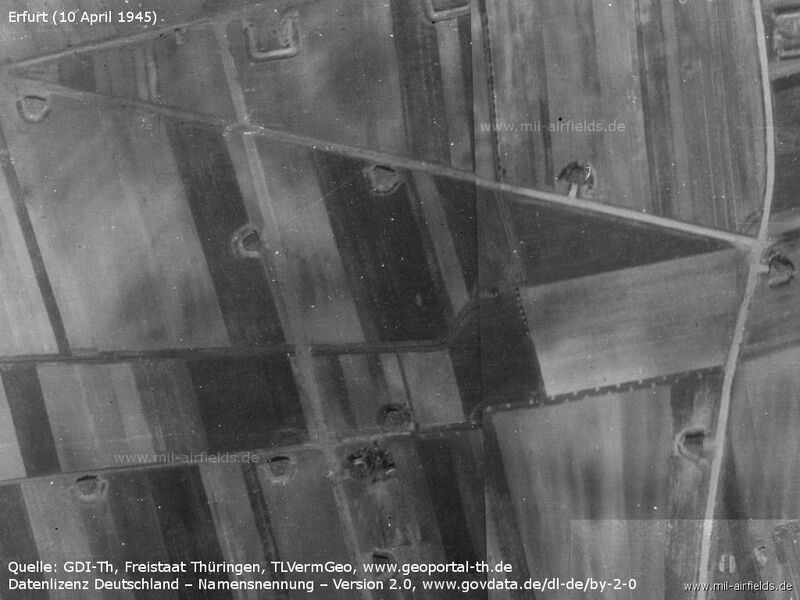 NB3 is the so-called fighter trapeze in which the air base is located. 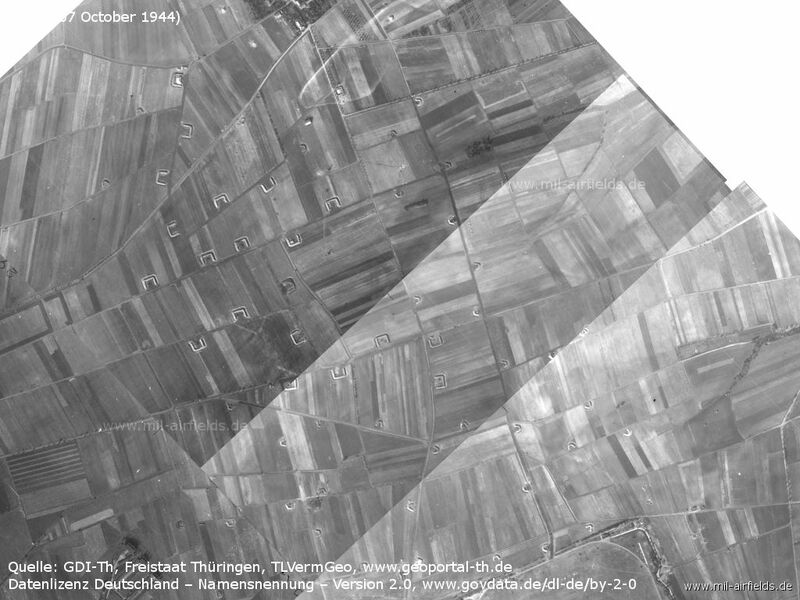 - The fighter trapeze describes the geographical position in a coordinate system. 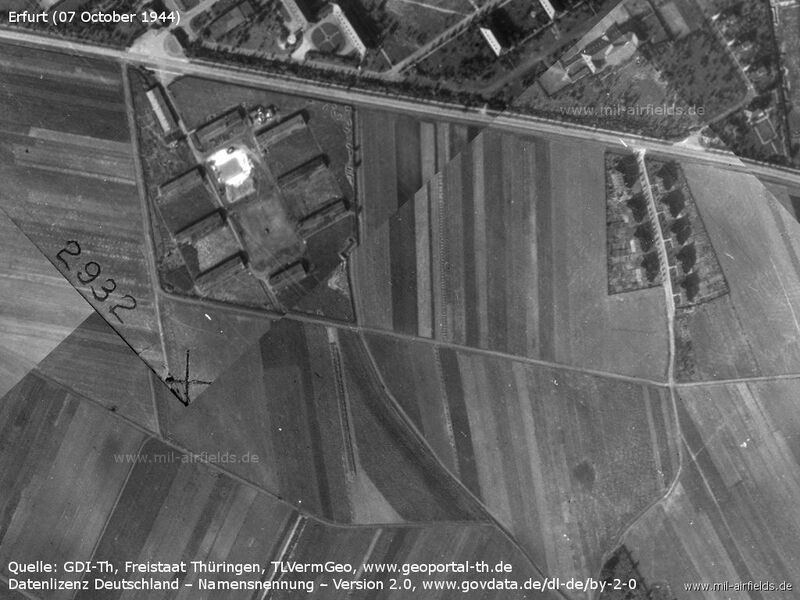 For quick orientation from the air, it is laid out on the ground. 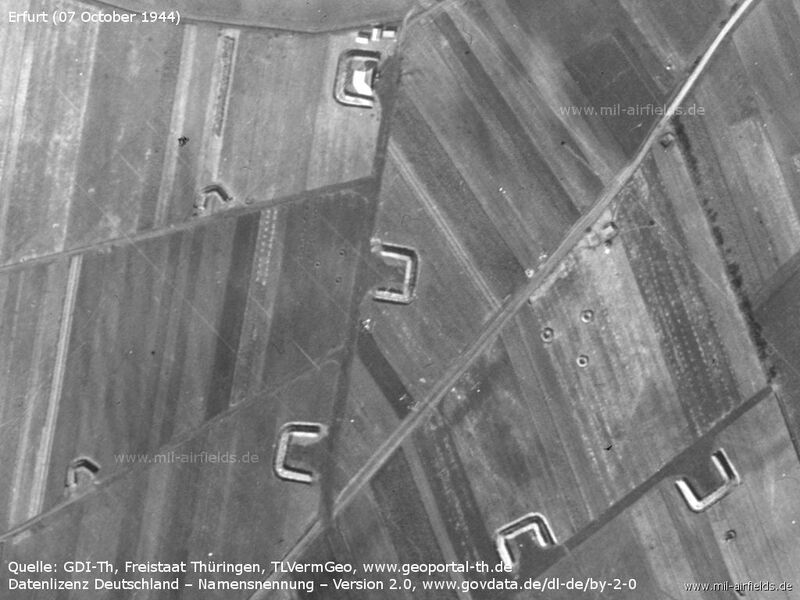 Large and small aircraft revetments - In the box at the top there seems to be a tent or something like that. 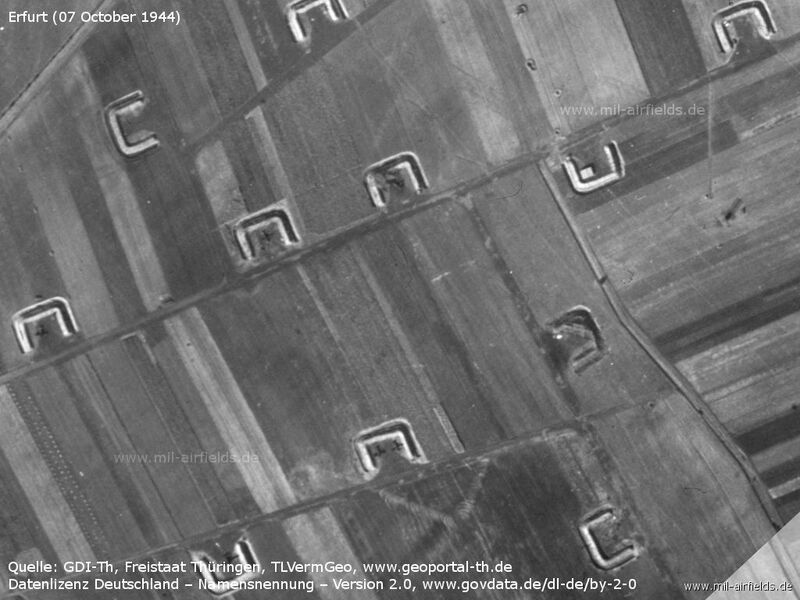 The circles arranged to a triangle probably form an anti-aircraft position. 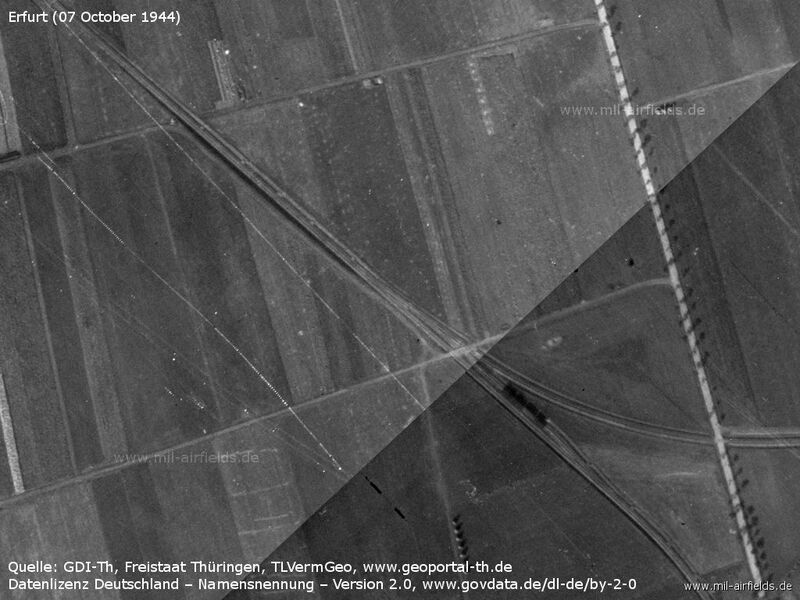 Railway line Erfurt - Nottleben with train. 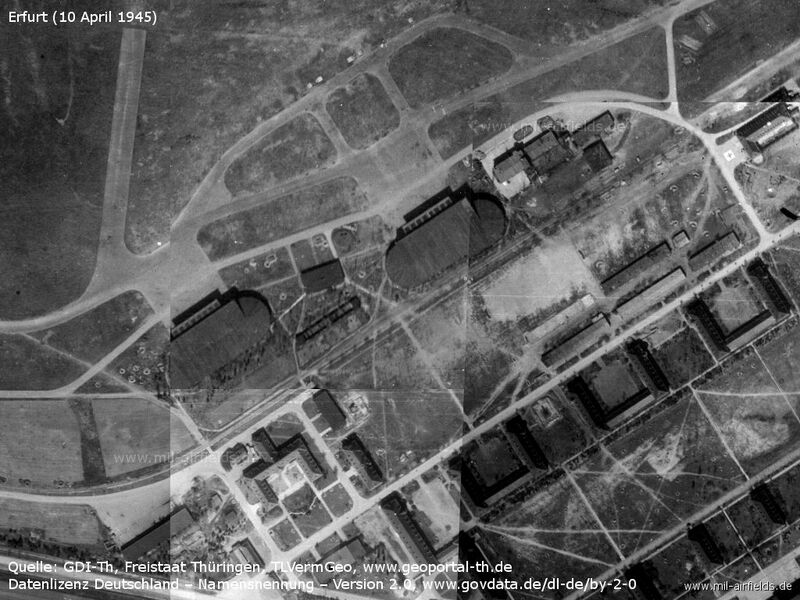 The air base siding leads to the right. 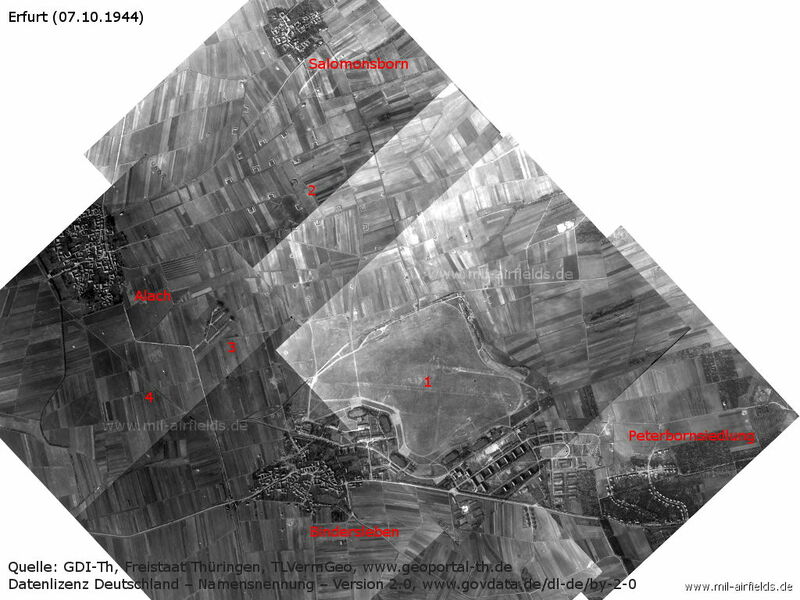 The following pictures must have been taken shortly before the US occupation. 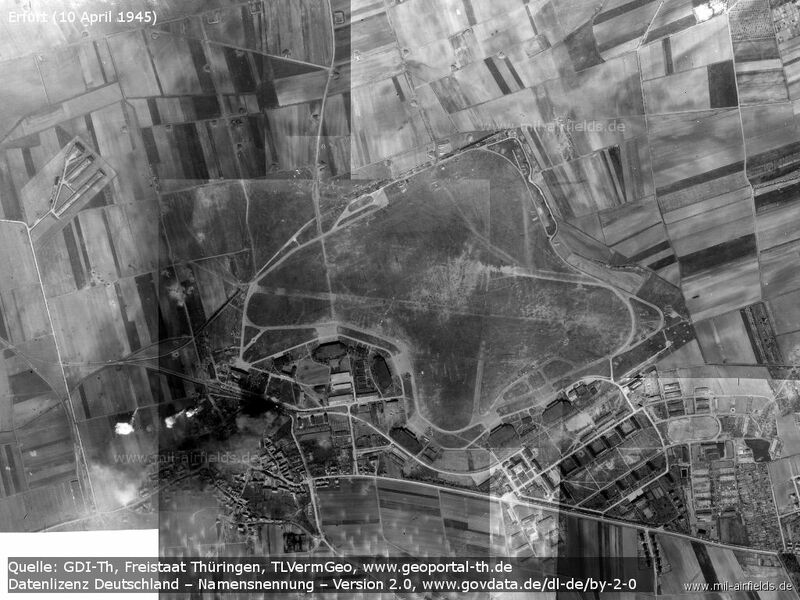 The air base and surroundings on 10 April 1945 - The pictures must have been taken shortly before the US occupation. 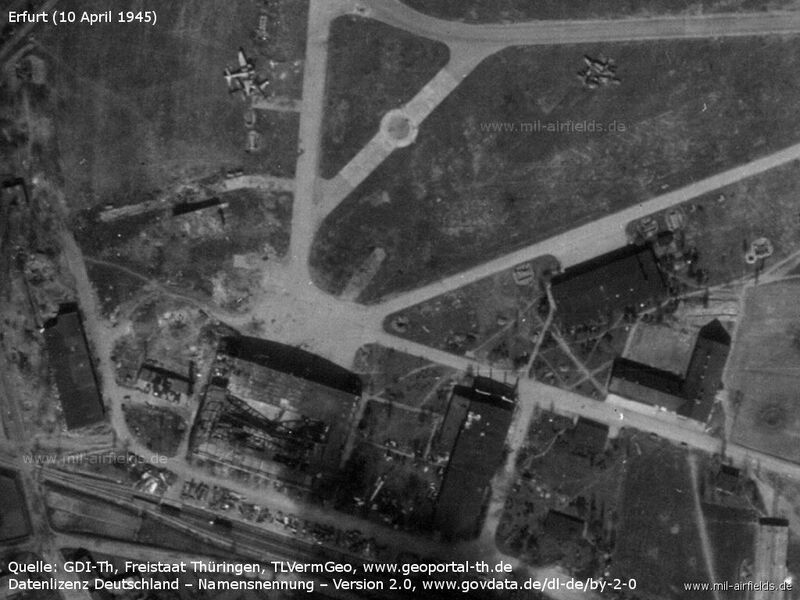 The hangars in the southeast also look undamaged. 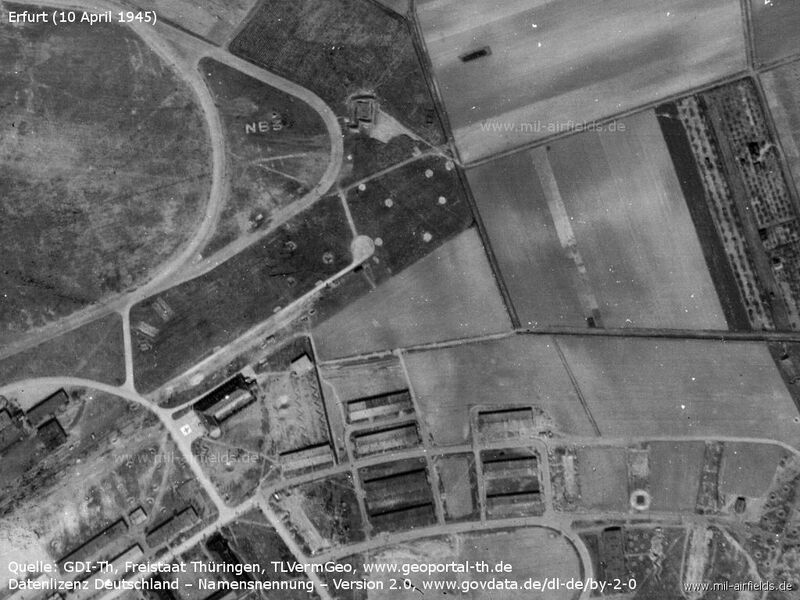 There are countless craters, the buildings west of the garden are missing. 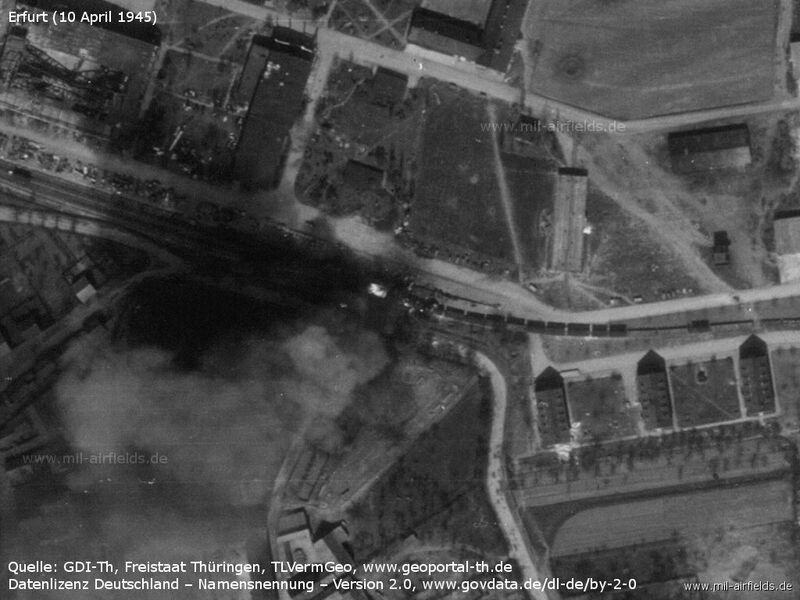 Detail: Fire at a railway car on the siding that runs behind the hangars. 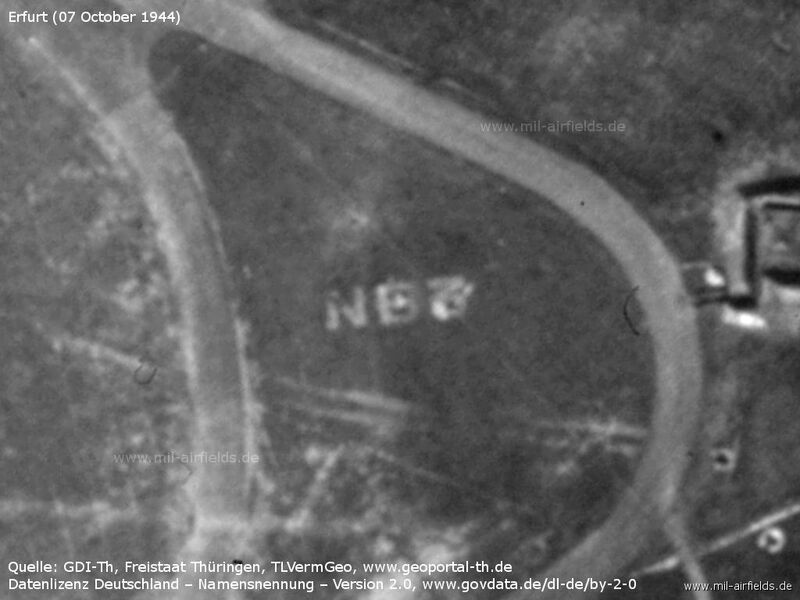 Northern part - Only a few aircraft are still recognizable. 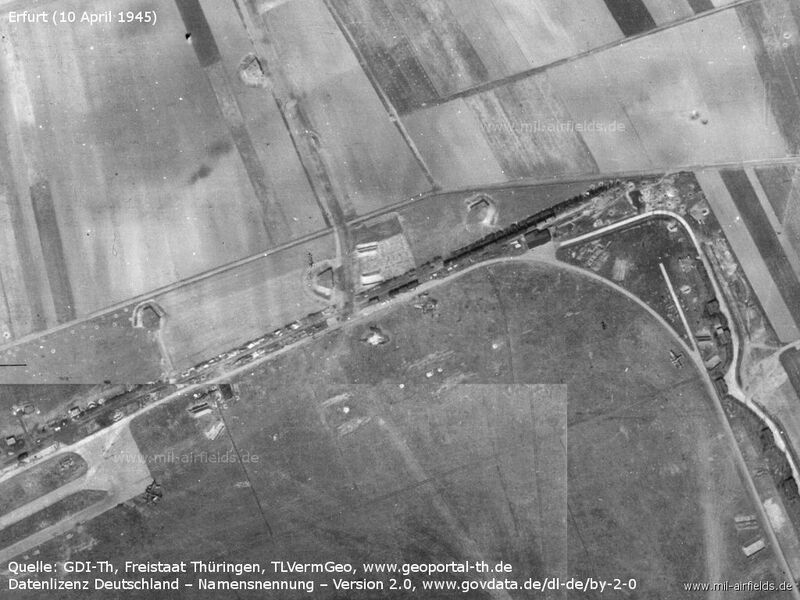 There are several railway cars on the tracks.